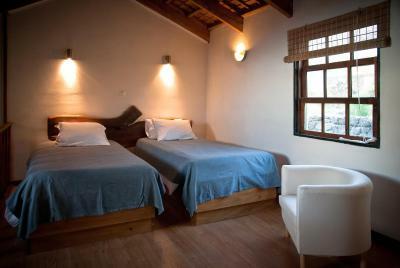 Lock in a great price for Hotel os Moinhos - rated 8.5 by recent guests. Breakfast was excellent: crepes, four kinds of homemade jam, two kinds of local cheese, a bowl of cut-up local fruit, a small pitcher of fresh-squeezed orange juice, decent coffee and eggs as desired. Better than any of the large tourist hotels! 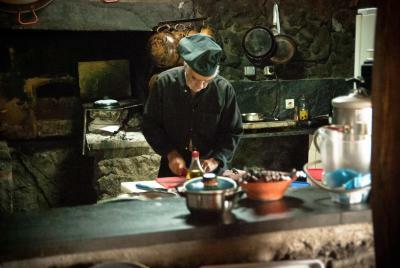 We also had four dinners at their Fornos de Lava restaurant, with a nice (but not overly large) selection of local meat and fresh seafood, and well-prepared and presented vegetables. The salads from ingredients grown in their own greenhouse were outstanding. The owner and her son--Felicia and Rodrigo--were knowledgeable about food and cared about preparation. 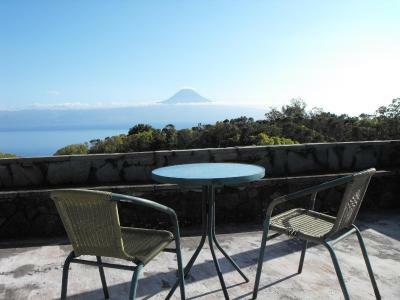 The striking view of Pico island from the restaurant, and its snow-capped volcano on the last day of our stay, was a large plus. The king bed in our three-room suite was very comfortable. The four friendly cats just outside the restaurant were a decorative bonus. Great location. Very clean spacious room and the owner was exceptional, very friendly, welcoming and extremely helpful. The view was great and the breakfast was really good. Home-made crepes made my daughters day! It fueled us well for our days adventure! It looked like you could get a lunch to go if you needed it. It was a safe location with a cat family my daughter played with. We even found a baby bat, so cool. Great one with nature place. 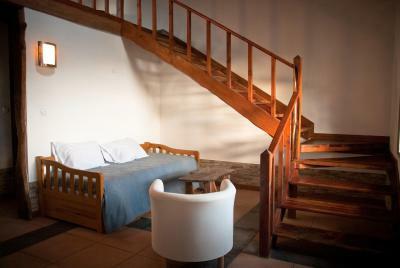 Extremely roomy and comfortable suite in a self-contained cottage with living room area. Beautiful rustic surroundings full of flowers and greenery. Lovely hospitality from Leticia and all her team. lovely location on a lovely island. Great restaurant for breakfasts and dinner. The walk down into Velas is nice, the Zig Zag path down the cliffside delivers you into the heart of a very pretty town....But its steep! We loved the natural bathing pools in town which seem a feature of all the islands. The location looking straight across to Monte Pico. A very peaceful spot. Our hostess was very welcoming, friendly, and helpful. The breakfast is really good, with a mix of fruit, bread, butter, cheese, crepes, tea/coffee, and (optionally) eggs. The associated restaurant (Fornos de Lava) is also really good; we had the fish & limpets cataplana one night, and the version with rice the other night. Ask for the spicy version! Excellent place to stay. Family run hotel and restaurant. Very nice rooms, friendly and helpful service and a good restaurant. A very nice breakfast: crepes with homemade confiture, warm bread and scrambled eggs made just for you as you wish. The landlady is very nice and does everything to host you well. 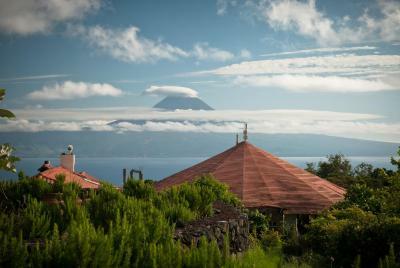 If you are lucky enough to have a sunny day you can enjoy a great view for the coast and neighbour island of Pico. 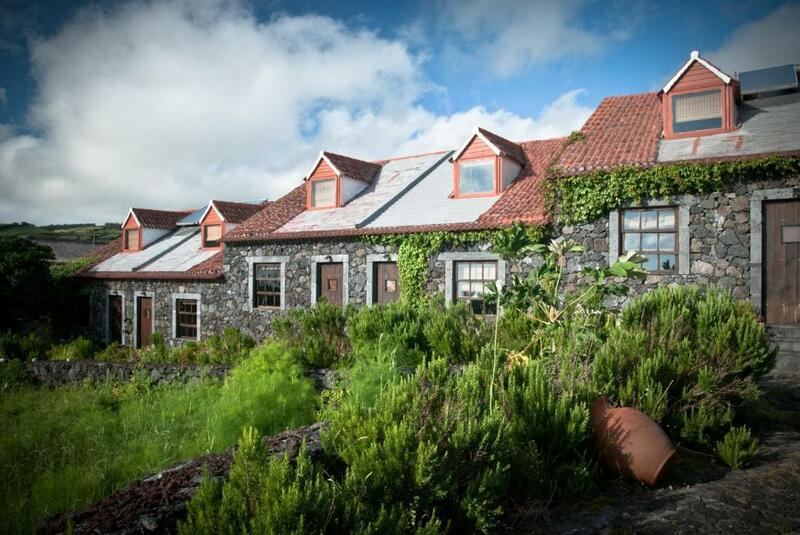 Os Moinhos is located in São Jorge Island, with views over the highest mountain in Portugal, sited in nearby Pico Island. The unit includes a garden and an à la carte restaurant. The rooms have a flat-screen satellite TV, a hot tub and a seating area. Private bathrooms also come with free toiletries and towels. 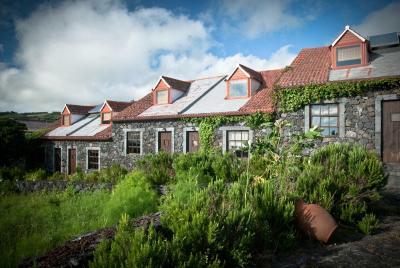 Guests can enjoy a sea view and a mountain view from all the rooms. Extras include free WiFi. 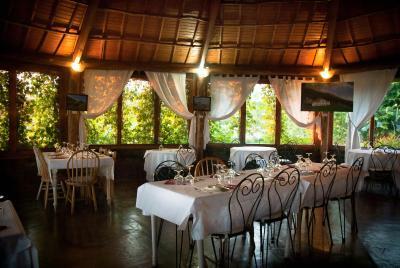 Guests can enjoy traditional Portuguese meals in the unit’s à la carte restaurant Fornos de Lava. Each morning a buffet breakfast is served in the common meal area. The nearest restaurant is 20 yards away. Room breakfast is available, upon request and at an extra fee. The harbour, with boat connections to the other islands in the Azores, is a 7-minute drive away. It is a 6-minute drive from the Velas centre. 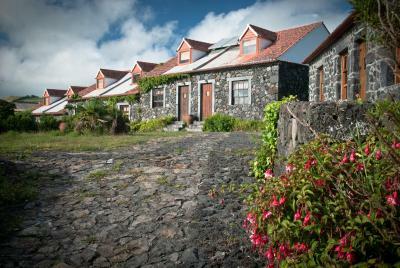 The São Jorge Airfield is a 4-minute drive away from the Os Moinhos. 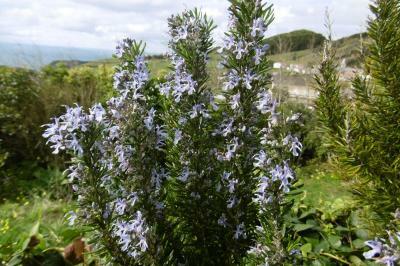 Hotel os Moinhos has been welcoming Booking.com guests since 29 Nov 2013. 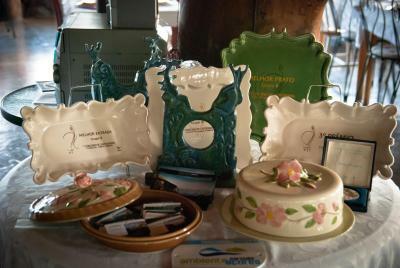 When would you like to stay at Hotel os Moinhos? This suite features a tile/marble floor, sofa and patio. 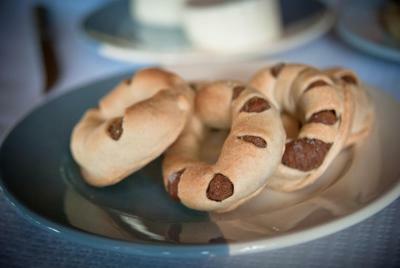 House rules Hotel os Moinhos takes special requests - add in the next step! Hotel os Moinhos accepts these cards and reserves the right to temporarily hold an amount prior to arrival. Please inform Hotel os Moinhos in advance of your expected arrival time. You can use the Special Requests box when booking, or contact the property directly with the contact details provided in your confirmation. Rather difficult to find os Moinos, but worth the effort once we got oriented. We arrived by taxi at 9:30 PM with no problem; had we tried to arrive by rental car (which we picked up the next morning) we may well have had difficulties. Hot water took a long time to arrive in the bathroom (once there, it was hot), but the owners were aware of the problem. Leticia was very welcoming and helpful and went out of her way to make our visit enjoyable. The setting and views of Pico volcano and gardens were delightful. The suite was beautifully decorated and the bed very comfortable. The breakfasts of fresh breads, cheese, home made jams, and crepes were fabulous! We highly recommend this property. Everything! This is NOT a hotel, it is more a very very expensive B&B. The pool is not a pool, no usable minigolf, the food in the restaurant is cooked very bad, the most expensive restaurant we met on the Acores, we payed more as 75 € for a ditter for two!! In the rooms you can hear everything from the next room. You can't close the windows properly. Needs fans or air conditioning when the weather is so hot. The staff and food were awesome. Can't beat the location and view. Costs were very reasonable and we will be back. A fan would of been an added bonus as there was no ac. We slept with the windows open, but it was warm to start off the evenings. There was nothing I did not like. It is a little further from Velas than I thought but the taxi back up the hill is about 6.5 euros. The chef and I had a disagreement about what a T bone steak is! He produced a chunky fillet steak with a bit of bone attached! No No No! Not anywhere else in the world! It was nice anyway, but I had skipped lunch hoping for a perfect T Bone! The Boca Negra I had first day was perfectly cooked and presented! There was no non-slip bath mat in the bath, so using the shower was difficult. It needed a mat or safety rail. There were ants in the room, but considering the location, you couldn't expect anything else. Our room was a beautiful suite. The breakfast was amazing. Crepes, eggs, fresh fruit, and juice. Breads.., cheeses, & more. We were not hungry again until evening.